Heavycat, a photo by aghrivaine on Flickr. This is Dummy The Cat. Dummy has perfected the martial art of Heavycat Technique. She is capable of making her (really rather slight) mass seem incredibly greater than it actually is. Dummy actually weighs about as much as a particularly large grapefruit. But when she is using her Heavycat Technique her mass seems to be that of a cannonball. But last night, she transcended Heavycat and achieved the ultimate expression of the method, the full flowering lotus of Quantum Entanglement Cat. I woke up in the middle of the night with an incredible weight, pinning my legs to the bed like a Volkswagon Karmen Ghia. Realizing I'd become yet another victim of Shaolin Heavycat, I tried to roll over. The weight actually STUCK to my legs. I realized I'd have to channel my ki and really shift this mass - and when I tried, I could find no purchase, no grip at all. Through sleep-dimmed haze, I realized, this freaking cat had rolled herself up tight into the blanket, like a cat burrito. She was completely ensconced in it, and I could get her out until I unwound the blanket, and carefully extracted her. 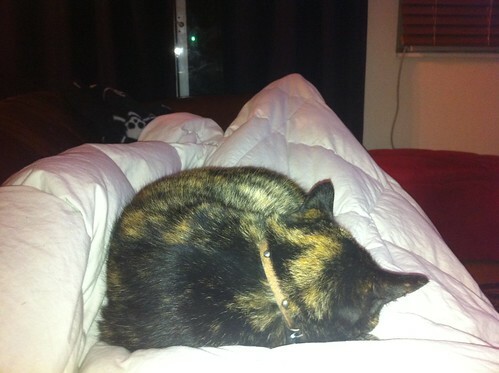 After which she promptly went right back to laying on my legs.